I'm still here! Just popping in to say, "Hello!" I haven't been posting because I've been traveling and working - not at the same time. Right before I left in December I worked on an episode of DIY Dash with Awesomeness (watch the episode here: https://www.youtube.com/watch?v=8b15MtYB0rI). Literally the next day I flew out to Europe until January. In January I went full force and have been working on the Lumpia 2 movie which is still happening now. You're probably asking yourself, "Does is it really take this long to edit a feature?" Short answer is no. Long answer requires some explaining. 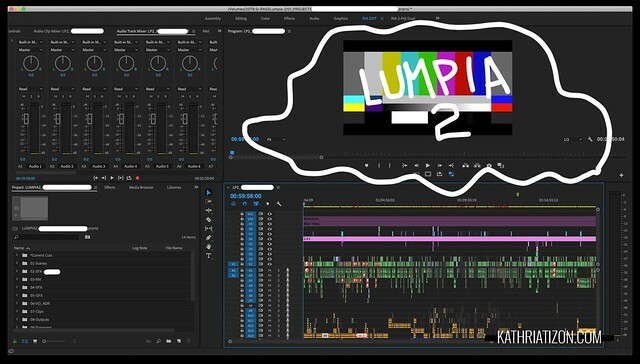 I'm thinking about writing an article regarding feature film editing not particularly about Lumpia 2, but features in general. This is my second feature film so I have some insight to share. Stay tuned for that. Isn't our sequence crazy looking? To me this is actually organized. This is one of the handful of reels we have for the movie. Isn't it also crazy to think I'm editing a feature on a laptop? Insane.